Ritchie is the newest addition to the team. He is a registered KWPN and was imported from Holland early in 2003. He is extremely well bred, by Garanco who is the only son of the legendary Jasper. Jasper, under the name Little One, became world famous by winning the Hamburg Derby with Hugo Simon. 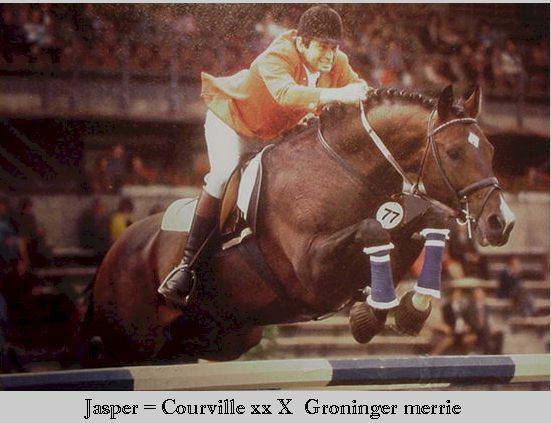 Jasper is by the thoroughbred stallion Courville, historically one of the most influential TB sires in KWPN breeding. Garanco's dam, Baranka, is by the legendary G Ramiro Z. In a lifespan of thirty years, the "preferent" G Ramiro Z's performance as a sport horse and breeding sire earned him the titles 'Stallion of the Century' and "King of Sires." Arguably the most influential jumping stallion ever, Ramiro's progeny also distinguish themselves in dressage as well. Ramiro Z lines trace back to the famous thoroughbred Cottage Son, a fabulous pedigree which combined first class racing and steeplechasing lines. Ritchie has enormous paces - an exceptional walk (gaining a 10 in one of his tests!! ), a very good trot (consistently scoring 8's and the odd 9), and a huge canter with a superb attitude to work. Very active through the hind leg, elevated paces and a big front. He is a very friendly horse and a quick learner but with that bit of "thoroughbred attitude" that says I'm a star. Ritchie is a very successful dressage horse who usually qualifies for all major Championships. North Grange Black Magic (Belle) is approximately 14hh. She is by the Riding pony stallion Romany Jo-Jo out of a registered Welsh Section D mare - Cascob Little Princess, and is herself registered part bred Welsh. The video below shows Belle competing in Prelim 13 at an Affiliated Dressage competition in February 2007. She won the Open section with a score in the high 60s% and was 4th overall in a very strong class. We added the music track afterwards - just for fun! Click on the arrow in the centre to watch the video. She is an extremely pretty mare with fabulous paces who has competed successfully in affiliated prelim and novice dressage but has been competing in unaffiliated dressage at both Elementary and Medium level. She has done exceptionally well and is always in the top 5 with scores usually over 65%, regularly beating many senior riders on big moving warmblood horses. She is well behaved at competitions and being very well schooled and correct in her way of going . She has quite a powerful movement and rides like a small horse. Belle has been very lightly shown in novice SHP classes at County level and has been placed each time. Correctly trained, well schooled including lateral work, good jumper, hacks out, well behaved, fun pony. Belle has competed at the BD Winter Regionals 2009 at Prelim level and did very well, she is a pony of the very highest quality with a huge talent for dressage. Pagan stands about 17 hh. This striking horse is by the warmblood stallion Meacham Annapolis (Atlantus / Takomama) out of the Irish Draught mare Borderfame Carmen (Torspark Benedict / Borderfame Tosca). The video on the left shows Pagan competing in Prelim 14 at Affiliated Dressage in March 2007. We added the music track afterwards - just for fun! Click on the play button to watch the video. Grandsire Atlantus has produced many exceptional competition stock - more Select and medal winning progeny than any other British based stallion. Atlantus is the sire and grand-sire of many top class horses who excel in all disciplines. Atlantus is by Galanthus who was an international showjumper and graded Danish stallion, and carried both Hanoverian and Trakehner bloodlines. Torspark Benedict descends from some of the most famous Irish Draught bloodlines of Ben Purple and Skippy. Pagan is a very impressive, big, upstanding boy with plenty of bone, an exceptional long, flowing stride and an unflappable temperament. With his fabulous "off the floor" paces and stunning good looks, Pagan is a successful dressage horse, competing at Elementary level and working at Medium at home with all lateral movements established. An uncomplicated and experienced competition horse who is good in all respects and handled and taken to competitions by a lady on her own. Flyte is 11 years old and by the warmblood stallion Meacham Annapolis out of the prize winning small Show Hack, Fineart of Lowmoor. The thoroughbred mare Fineart of Lowmoor by Totem, carries some of the most illustrious thoroughbred lines of all time. Totem is by Al Nasr and traces back to Nasrullah through his dam lines. Al Nasr himself was by Lyphard. Lyphard was Northern Dancer's fourth-crop son. 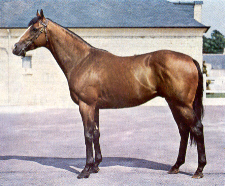 Trained by Alec Head, Lyphard was one of the best two-year-olds in France in 1971 and won the Prix de la Foret and Prix Jacques le Marois (both now Group 1) at three. Lyphard was one of the best sires of the 1970s and '80s, leading the French sire list in 1978 and '79 and the U.S. list in 1986. The legendary Northern Dancer was a racing phenomenon and sired 635 foals: of the 488 that started in races, 368 were winners of which 146 were stakes winners. 26 of these animals were champions in Great Britain, Ireland, France, Italy, The US and Canada. Northern Dancer descendants dominate racing the world over, and he is recognized as the greatest thoroughbred sire in modern history. Flyte has the classic thoroughbred good looks coupled with the more relaxed temperament of the warmblood. Standing at about 15.3hh, he is beautifully elegant, an outstanding, extravagant mover and a real show off. He is a true hack type and has the potential to make a top class large Show Hack, however, with his exceptionally elevated paces he would also make a very high-class dressage horse. Flyte is now for sale to a competitive home. Update Summer 06 - Flyte has now been sold to a professional showing yard and is now one of the most successful Large Show Hacks in the country! We very sadly lost Careless Whisper in Dec 2003. He was bought in 1985 and was produced for the show ring by Stuart and Nigel Hollings. He was one of the most successful large Show Hacks of the late 1980’s with many wins and championships to his credit. He qualified for both The Royal International and The Horse of the Year show and was placed fourth in the large Hacks at The Royal International Horse Show. Into his 20's he was still successfully competing in unaffiliated Dressage. He was doing well in Novice classes consistently gaining over 65%. He has also tried dressage to music and really enjoyed himself – showing off was always one of his strong points.